How Are Your Assets and Liabilities? PURA Vida and welcome to part 3 of our series on investing! It’s been a while! For those of you just considering investing or beginning, this is a series on investing for absoute beginners. Please catch up on the first two parts to read up on personal assets and liabilities. Today we are adding a little of the corporate world into the mix of our investing basics. People are very careful when investing because making profits make us less happy than losses make us unhappy. Assets are things that make money for us and generate additional income. Liabilities are things that take money from us and cost us money. Something may appear an asset but not be an asset, such as buying a home or a car. We have to be in reasonable shape financially before we can consider starting investing. So, we are working on shrinking and improving our personal list of liabilities. Our target is to improve our finances and grow our asset lists to start investing. For completion, let’s get into more detail on some facts about assets and liabilities in the corporate world. In business, generating assets and cutting expenses is also desirable. Positive financial development is beneficial for the life and future of an enterprise. Therefore, assets benefit a business in the long term. Individuals want to reduce their liabilities. Enterprises also have to pay off liabilities at set times in the future. Most liabilities don’t benefit a business in a short term. Liabilities are obligations, meaning the business legally has to pay back money to someone, usually with interest. Corporate assets that can be liquidated – that is sold, used up, processed or paid back – within a year are called current assets. Some examples for current assets in the corporate world are cash and cash equivalents. Cash has to be available for daily operations and cash equivalents are, put, short-term investments that can be liquidated at very short notice to be turned into cash if needed. This could be for planned acquisitions. Non-current or fixed assets are for the long term. They include items that are not sold to end-consumers but are used in the company for production. They also include machinery needed for production and vehicles a company needs to transport goods. Finally, there are other types of assets that cannot be immediately converted to cash. However, these items are beneficial for the company over the long term. Non-current assets may also include investments in other companies or patents. Companies may get into the situation of requiring financial funding from the outside for new projects or expansion due in the near term – a current liability. A current liability is also “wages payable”- that is any money a company owes its employees, and “taxes payable” to the government for payroll taxes. Current liabilities are usually obligations of the company that are due within one year. Non-current liabilities are long-term liabilities the company will not be paying back within one year, such as long-term provisions, for instance for benefitting employees and long-term taxes the company owes now but will pay back in the future. A savvy person or any corporate entity with a healthy financial life has a high proportion of assets to liabilities. Consequently, a successful business is a business that has a high proportion of assets to liabilities. All in all, start with your household finances try to build assets and to avoid liabilities. Make sure you tune in for part 4 of our series. This is where you want to start investing in cryptocurrencies. 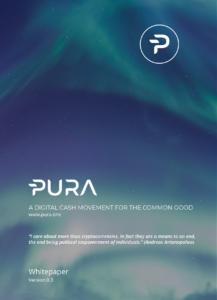 Please note this PURA article is merely for the purpose of information and does not serve as investment advice or financial service. Trading and investing involve substantial risk of financial loss, including loss of principal and all trading and investing you pursue is at your own risk.